Fellow honor guard colleagues, a military funeral with Taps played on a CD player or through an electronic adapter for a bugle just isn’t the same. That’s whay Bugles Across America was founded. Bugles Across America, NFP was founded in 2000 by Tom Day, when Congress passed legislation stating that veterans have a right to at least 2 uniformed military people to fold the flag and play taps on a CD player. Bugles Across America was founded to take this a step further, and in recognition of the service these Veterans have provided to their country, we felt that every Veteran deserved a live rendition of taps played by a live Bugler. To this end, we are actively seeking volunteers to provide this valuable service to Veterans and their families. Read more here. Please like their Facebook page by clicking the image above. This great program provides a bugler for as many funerals as possible across the US and it even has a bugler in Germany, my friend and honor guard colleague Hartmut Hausser. 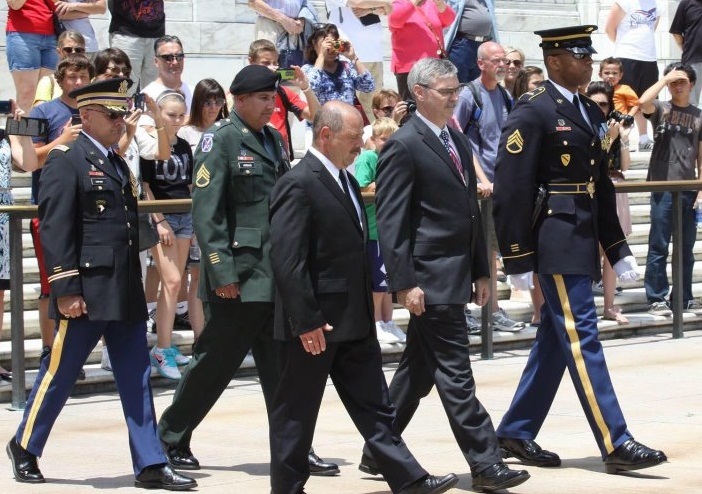 In the picture, below, Hartmut (shortest) is in the US at the Tomb of the Unknowns for te 150th anniversary of the bugle call Taps.